Located far from the madding crowd at the extreme southwestern tip of Indonesia's paradise island, Pansea Puri Bali enjoys a unique setting and atmosphere. It is well appointed on a serene stretch of shimmering beach in the gently curving Jimbaran Bay facing the sparkling blue Indian Ocean. Just 10 minutes away from the airport, Nusa Dua or Kuta Area. Pansea Bali is an experience like no other. An exclusive boutique resort that captures the spirit of Indonesia's Island of the Gods and celebrates its extraordinary natural beauty and cultural heritage. A sanctuary that excites the sense and soothes the soul. Eloquently weaving its magic on Bali's famed Jimbaran Bay. Pansea Puri Bali comprises of 41 thatched-roof cottages, of which one caters to families, designed in traditional Balinese-style architecture. Stepping into a cottage is a retreat into a world of your own, as each cottage, hidden behind private walls, encloses a landscaped courtyard with a dining pavilion - the perfect place for a romantic dinner for two under the stars. The spacious bedroom in the cottage opens out to a verandah where you can relax in wooden armchair, comfort and privacy shielded discreetly from neighboring cottages by bamboo screen. The Family Cottage has 2 large bedrooms with separate bathroom fittings. Accommodates up to 4 adults or 2 adults and 2 children. 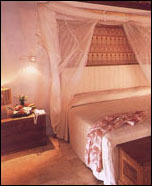 Each air-conditioned cottage is furnished in typical Balinese decor, using plenty of hardwoods and textiles. There is a king-size bed, a sofabed, ceiling fan, satellite television, minibar, personal safe and IDD telephone. A sunken bathroom which leads to an outdoor shower in the garden adds a touch of luxury. Freeform Swimming Pool, Children's Pool, Children's Activity Corner, Watersports Activities, Restaurants and Bar, 24 hours Room Service, Library and boardgames, Laundry and Dry Cleaning and Parking Area. Taxi on Call, Doctor on Call, Tour and Travel Desk, Boutique and Gift Shop, Postal and Shipping Services and Baby Sitting Service. For those who prefer to explore Bali, car and jeep hire, with or without driver, is also available. Important Note: Japanese visitor, please contact us for rates.